Two Mercedes with a point to prove, Red Bulls bookending the grid, and a soggy start. Monaco 2016 had all the ingredients to put on an absolute classic, and it did not disappoint. Join us as we take a look at the things that caught our attention in Monaco with the Badgerometer. The FIA announced this weekend that the flip-flop cover Halo device is getting the go-ahead as driver head protection over the Aeroscreen, which looks better, doesn’t impair visibility, and you can climb out of the car with it on. I’m no tech expert, so I’m not going to attempt to talk about its aero performance or structural integrity, but if it saves one driver’s life, then bravo. Just a shame it looks so daft. In more announcement news, Red Bull and Toro Rosso announced a renewed partnership with French engine maker and yellow fans Renault. Unless you live in some deep dark place without WiFi, you won’t need telling about the fizzy drink peddlers’ very public spat with Renault after their struggle to adjust to the new hybrid turbo formula, despite all those lovely world championships. RBR managed to wangle a deal to re-badge the engines as TAG Heuer, while STR are currently powered by 2015-spec Ferrari engines. I can only imagine the incredibly smug faces of the Renault top brass as the deal was struck, but I bet it was beautiful. In Monaco, Nico Rosberg couldn’t muster the pace and consistency seen in the first four races of the season, indicated by his gentlemanly conduct in letting Hamilton past early in the race, a move that would ultimately aid his team mate in the win. 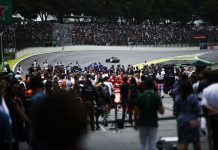 Rosberg looked set to secure sixth place, but a spirited Nico Hulkenberg had other ideas, and on the very last lap, he got past his rival on the finishing straight, ending up just over two tenths ahead. Sergio Perez is quickly becoming one of our absolute favourite drivers at Badger GP…again. His commanding of the Sauber in 2012 was ace, when he nearly won in Malaysia and picked up three podiums, and we loved him. Then he went and had that tricky year at McLaren, and his pace was sort of forgotten. The last three seasons have heralded three podiums for Force India – all of them from Perez, not his highly-favoured team mate and Le Mans winner Nico Hulkenberg. Perez got on the podium in Monaco because of a brilliant tyre strategy, and his own prowess at conserving rubber. In his very first race for Sauber, back in Australia 2011, he was dubbed ‘Checo the tyre whisperer’ for his affinity with Pirelli. His Bahrain 2014 Podium, Russia 2015 podium (while a little more fortunate) and now Monaco 2016 podium were all down to stretching tyre wear to the absolute limit. Of course, silly season is never far away, and so he’s already being linked with a Ferrari drive once Kimi Raikkonen’s contract expires. This is definitely the best Monaco Grand Prix I’ve seen in the last few years. In fact, when I think about it, I don’t think I’ve seen a live one this good; the 1996 race featuring Panis’ sole F1 win probably tops it. 2011 may have had it beaten with the awesome Vettel-Button-Alonso fight, but a pesky red flag put paid to that. Hamilton’s 2008 wet weather win in the principality springs to mind. He was skilful in his driving back then, getting past both Ferraris, but had to rely on luck as well. He clouted the wall and got a puncture, so had to make an early pit stop on lap 6, but a very timely Safety Car meant he had the opportunity to seize the lead later in the race. If Ricciardo didn’t have the mother of all balls-ups in the pits with his team not ready with tyres, he would have won this race. That’s a given. Hamilton proved that you’ve got to be in it to win it though, and after his own Monaco nightmares in the last two events, he was probably long-overdue a win himself. When Hamilton missed the Nouvelle Chicane after the Virtual Safety Car, it looked like Ricciardo would get past on the run down to Tabac, but the Aussie was squeezed wide, and though he remained within a second of the Mercedes all race, he couldn’t quite get the job done. Ricciardo was in stunning form all weekend, and the Red Bull chassis looks ace. It might take a high-downforce track like Hungary or Singapore to get the job done, but he’ll be up there, for sure. Elsewhere there were team mates colliding, champions making mistakes, McLarens scoring more McPoints, and drivers pipped on the line. It was epic stuff. Roll on Canada! The spoiled blonde kid that everyone loves to hate the most (well, perhaps tied with King Joffrey from Game of Thrones) Justin Beiber rocked up to the Monaco GP. There’s nothing particularly noteworthy about this; Monaco is of course a playground for the rich and famous and there are celebs aplenty in the paddock. What narked us is that Beibs was allowed not only into the paddock, but into Parc Ferme after the race. 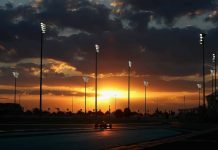 Not content with being a plastic entitled little s… so-and-so, he somehow blagged his way into the area usually reserved for team members and FIA personnel, taking a hearty gulp of race winner Lewis Hamilton’s champagne in the process. Meanwhile, over at the Indy 500, they got the ultra-talented Lady Gaga. Here’s hoping that next year we get some real pop royalty like Nik Kershaw or Chesney Hawkes to show up at the GP.